Electrical power transformers are electrical devices commonly used in engineering that transforms both the voltage and the current of the electricity flowing through it. It is made up of a coil wrapped around an electromagnet that transfers the electricity. Unlike distribution transformers, power transformers are designed to operate at 100% efficiency (distribution transformers operate at a maximum efficiency of only 60-70%). Another main difference between distribution and electrical power transformers is that power transformers are meant to handle high voltages, whereas distribution transformers are meant to handle lower voltages. Power transformers transfer power to distribution transformers, so that the distribution transformers can provide small amounts of power to individual users. What Do Power Transformers Do? Using a process called electrical induction, a power transformer transforms the current and voltage of electricity running in it into a current and voltage that works for the specific system it’s helping to run. Although the frequency of the electricity remains the same, it is transmitted at a difference value for both the current and the voltage. Power work together with distribution transformers to regulate power in transmission networks, either increasing or decreasing voltage levels depending on the needs of the consumer. Why Do I Care About Power Transformers? Do you care about the light in your home? That you continue to have your food refrigerated, and that your family stays happy and healthy? Power transformers help to regulate power to your home, meaning they’re not only necessary, they’re an important part of the complicated process in which our society uses electricity. The power transformer receives huge amounts of electricity, at 115,000 or 46,000 volts, which is way too much to have in any one home. Think of the power transformer as the instrument that’s handling all of the power for your entire neighborhood. From there, the power transformer distributes smaller amounts of electricity to the distribution transformer, and that transformer distributes that electricity to various homes, depending on their need. In that way, power transformers are kind of like the boss of distribution transformers: they provide all of the energy that the distribution transformers need to succeed. This dielectric test verifies the integrity of the insulation of each winding to all other windings and ground. The coil hot-spot temperature is the absolute maximum temperature present in the transformer. This number is equal to the sum of the following: T Hot Spot = T ambient + T average winding rise + T hot spot rise adder or rise above average. Continuous rating is the continuous power (kVA) the transformer delivers to the load without exceeding its specified temperature rise. The delta connection is a standard three phase connection with the ends of each phase winding connected in series to form a closed loop. Sometimes referred to as three wire. The phase relationship will form a Delta. A wye connection is a standard 3-phase transformer connection with similar ends of each of the phase coils connected. This common point forms the electrical neutral point and may be grounded. When the neutral is brought out it makes a 4 wire system. These tests consist of the application of a voltage higher than the rated voltage for a specified time, for the purpose of determining the adequacy of insulation strength and electrical clearances. Impedance is the impeding element against current flow. Impulse tests are dielectric tests consisting of the application of a voltage waveform with a very steep rise voltage applied to a winding. The test simulates a voltage and current surge through the transformer winding when a lightning induced voltage surge reaches the transformer. Efficiency is the ratio of useful power output to the total power input. Exciting current is current drawn by the transformer under no load conditions. It is usually expressed in percent of the rated current of the winding in which it is measured. In AC circuits, currents & voltages follow a cyclic pattern. Frequency designates the number of such cycles repeated every second. The unit of measure is hertz. This dielectric test verifies the integrity of insulation within a transformer winding and between phases. These materials are used to electrically insulate the transformer. That includes windings - turn to turn and layer to layer, and other assemblies in the transformer such as the core and bus work. Natural convection is the cooling class in which the transformer is cooled by the natural circulation of air. The load of a transformer is the apparent power delivered by the transformer in MVA, kVA, VA. When a transformer is energized under no-load, some power is drawn from the supply, predominately to feed transformer core losses, but to a smaller extent feed losses in the winding due to excitation current. These losses are termed “no-load losses”. Load losses are incident to load carrying. Load losses include I2 R losses in the windings due to load current, eddy current losses in the winding conductors, stray loss due to stray fluxes in the winding, core clamps, etc. and due to circulating currents in parallel windings. Unlike DC, AC power can be vectorially displaced. Various vectorially displaced windings can be connected to make an AC system. Each displaced winding is a phase. 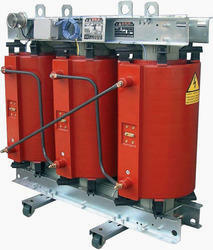 In 3 phase transformers there are 3 vectorially displaced windings. Power factor in a circuit is the relation of watts to volt amps. 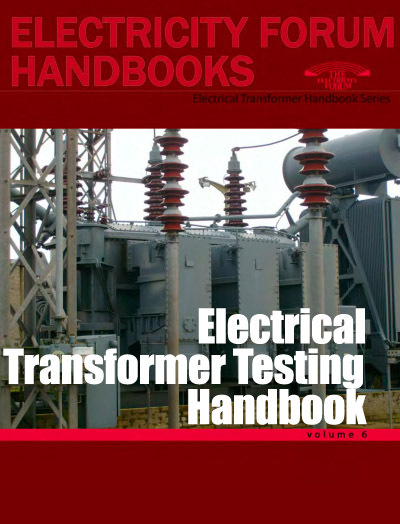 This standard test on transformers determines the instantaneous direction of the voltages between the windings. It determines if the winding connections are correct. This rating designates the input voltage for which the input winding is designed. This is the connection for three phase using two special single phase transformers. It is most frequently used to change from two phase to three phase or three phase to two phase. This rating designates the no-load load-circuit voltage for which the secondary winding is designed. The secondary winding is the winding on the energy output side. A tap is a connection brought out of a winding at some point between its extremities, usually to permit changing the voltage ratio. The average increase in temperature of a winding over ambient (determined by change in resistance) is known as the Temperature Rise of a winding. A transformer is an electrical device without moving parts which, by electromagnetic induction, transforms power between circuits at the same frequency, usually with changed values of voltage and current.